Here is a pewter cat pendant. Notice the smile on its face. The pendant is highlighted with gold, blue and red enamel. 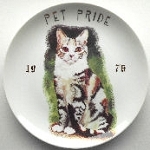 The back of the pendant shows the back of the cat. 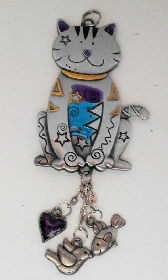 Hanging from the cat are 1" chains with a mini pewter heart, fish and bird. The cat itself is 2" high x 1 1/2" wide. Previously owned but in good condition.